From blood on a carpet to diesel at the roadside, spill kit requirements vary, so there’s sure to be one available to help you cope with any incident. Spill Control Centre look at the way they’re put together, and how they’ll help you stop a drama becoming a crisis by keeping you in control. Of course long-suffering Flo was talking about being short of money because her layabout husband was usually in the pub and always out of a job, but the comment holds a lesson for us in cleaning up spills. That’s because tackling any spill in the wrong way, without the correct equipment, can make the problem considerably worse. It might be that what’s been spilled, far from being cleaned up, is actually spread further. For example, hosing almost any kind of a spill into drains will clean the immediate area, but will create a new spill much further away from the original site. And cleaning up any kind of body fluid could bring whoever’s cleaning it up into contact with all manner of diseases with a range of consequences, not only for them, but also for people with whom they come into contact. And the further a spill carries, the harder is it to clean up. Think of the Deepwater Horizon oil platform in the Gulf of Mexico, or the Ebola virus in West Africa. 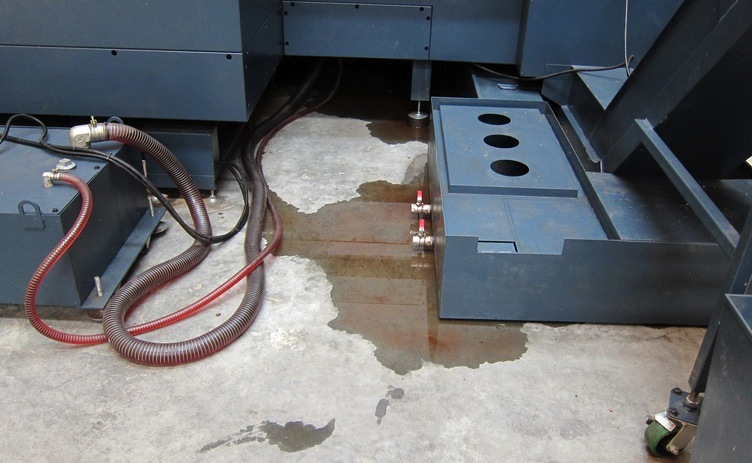 Naturally, the best way to deal with spills is to have the right equipment, procedures and training in place to stop them happening in the first place. However, accidents will happen, and when they do the best course of action is to deploy a spill kit, acquired in advance in anticipation of the event. Spill kit contents vary to suit the nature of the probable spill, but all include appropriate protection for the cleaner, varying from surgical gloves to red warning triangles for use at the roadside. Here’s a rundown of what you might expect to find in a spill kit created specifically for the most common kinds of spill. As well as the contents, check the detail of each of them in our product pages to make sure they have sufficient absorbents to deal with the scale of spill you might expect. Spill kits from The Spill Control Centre contain the exact products required for any spill of oil, chemicals, industrial liquids or body fluids at work – even if that involves a road journey, because we offer a purpose-designed ADR spill kit. Conveniently packaged and labelled, all contain a selection of appropriate absorbency products to suit the application. To deal with a spill of oil there are a number of clever products that will absorb oil whilst simultaneously repelling water, maximising their clean-up capability. The spill-absorbing products (oil ones are normally white) are offered as socks, pads and cushions, but you’ll also notice tubs of leak sealing putty – invaluable for running repairs to leaks when you’re not able to affect a permanent repair immediately. Kits can also include bags for safe disposal of the used absorbents. Chemical spill kit contents are generally, but not always, yellow to help identify them. They have a chemical composition suitable for dealing with even aggressive chemicals. The scale of each spill kit is an important factor in selecting the right one, and each spill kit is generally accompanied by instructions. These spill kits can also be used to mop up oil spills, but it’s advisable not to rely on oil spill kits to mop up chemical spills. These spill kits contain chemicals that solidify waste and make it easier to clean up form hard surfaces or carpets. Supplied in single or double applications, they also come in handy spill kit pouches making them easily portable for people covering large areas who might need very quick access to the right materials, such as first aiders or security staff. Any finally, in the event of any kind of spill where a proprietary skill kit has been used, the first step after the event should always be to re-order whatever you’ve used at the last spill, so you can be ready for the next time. Run through a spill kit checklist to see that what’s in the spill kit is actually what you’re going to need, and put in the order to cover any shortfall. This entry was posted in Spill kits and tagged spill kit, spills on July 2, 2015 by neil.stocks. The phrase ‘New Knights of the Road’ was coined by the RAC in advertising and marketing, and then AA later labeled themselves as ‘the fourth emergency service’. It’s all about providing the highest standards of help to people who find themselves in difficulty on the UK’s ever-more crowded road network, and to keep traffic on the move. But long before those two fine motoring organisations took on their catchphrases, ‘Knights of the Road’ was always a term applied to other groups such as lorry drivers. 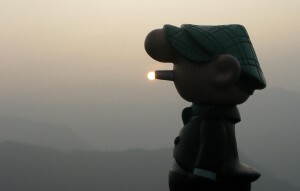 The latest developments in road safety merely serve to underline that title; but more of that in a moment. 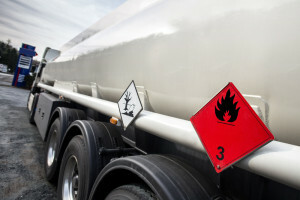 The transporting of dangerous goods has been governed by European law for almost 50 years. The legislation in question is the ADR regulations, whose name is an abbreviation of the French phrase ‘Accord Dangereux Routiers’, a simpler form of words than its English version ‘The European Agreement concerning the International Carriage of Dangerous Goods by Road’. Its purpose is to protect people and the environment in the event of an accident to a vehicle carrying hazardous materials. So important is the issue that the United Nations has done considerable work to harmonise the regulations across international boundaries to ensure that protection is as robust as it can be. Part of those extensive regulations requires vehicles to carry equipment contained within our ADR spill kits to deal with emergencies including spills and fires, and that drivers must be trained in their use. The list includes fire extinguishers, drain covers, boots and high-visibility vests, eye wash and an assortment of absorbents. ADR regulations also require vehicles to carry signs like those in the picture to alert others to when they’re carrying, so they know the best way to clean up a spill. Full details of what ADR regulations say must be carried can be found in section 8 of the ADR European Agreement that’s been in force since the beginning of January this year. It’s a common sense collection that calls for equipment to put out fires, to contain and clean up spills, keep operators safe and warn others that there’s been an incident, and is geared to the size of lorries carrying it. The requirement to carry it recognises that lorry drivers, on the road in their thousands, are always going to be first on the scene whenever there’s an incident, and can perform another emergency service the instant something needs to be done – and they’re ready to do it the moment they pull out of a depot and onto the road. That ability, and the contribution it can make to road safety, is being further recognised by an organisation called Driver First Assist, which is using it to reduce the number of fatalities in road accidents through ‘first-on-scene’ training. Driver First Assist was created by former HGV driver David Higginbottom, who says: “Currently, about half of all road traffic deaths are caused by airway obstruction, which can kill within four minutes…that’s half the UK’s ambulance target response time, so it’s not surprising that over half of fatalities occur before the arrival of the emergency services. Qualified DFA members, trained to manage the scene of a road traffic collision and administer basic first aid, can have a big impact on increasing the chance of survival for those involved, before help arrives. One such DFA-trained driver is Robert Carr, who works for Scunthorpe based Clugston Distribution who gave a short presentation on the company’s involvement in Direct First Assist at the House of Commons. From all of that it would seem that the first person who can help when something out of the ordinary happens on the road may turn out to be a lorry driver – so help could be closer to hand than you might think! Find out about the different ADR spill kits we can offer. This entry was posted in Spill Control, Spill kits and tagged ADR, ADR kit, emergency spill kits on April 22, 2015 by neil.stocks.